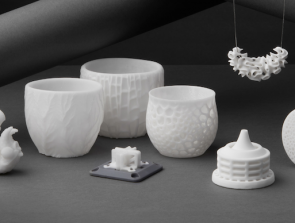 You might have graduated from standard PLA and ABS filaments, played around with conductive filaments, made a mess with flexible filaments, and made incredible prints with metallic or wood filaments. But perhaps you are looking for something different again – something with a little bit more flair. If that’s the case, then you will probably be glad to know that there is no other filament that is more stylish the glow in the dark filaments. In this article, we run through everything you need to know about glow in the dark filaments, including what they are, how they are used, and the best brands available today. What are glow in the dark filaments? Glow in the dark filaments are basically standard ABS or PLA filaments infused with a phosphorescent material. 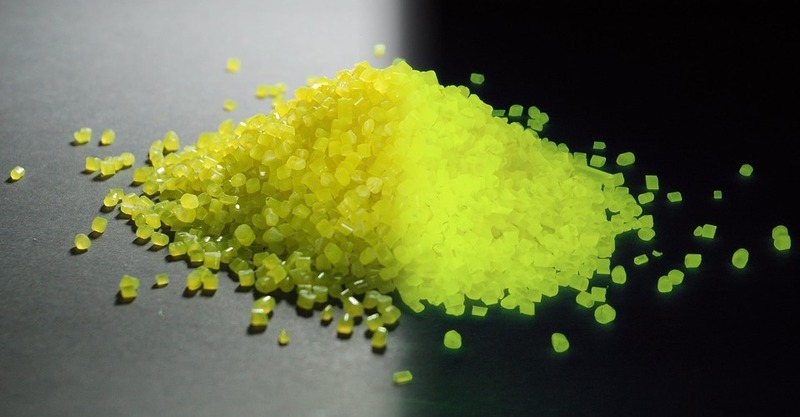 The most commonly used of these phosphorescent materials is strontium aluminate, although zinc sulfide and calcium sulfide are still used in some capacity. In a way, they are made in a very similar way to other composite materials such as carbon fiber filaments, magnetic filaments, and wood filaments. As we shall see later, glow-in-the-dark filaments suffer the same limitations as other composite materials but make up for them in aesthetics. How do the pigments glow in the dark, anyway? Phosphorescent materials work by absorbing energy from ultraviolet radiation and re-emitting this energy in a slower and less intense manner. This is how glow in the dark toys and paint are charged by any normal light (indoor light or sunlight) and glow under darkness. The light that these objects emit slowly fade out and completely disappears typically after several minutes to a few hours. Strontium aluminate has enjoyed popular use as the phosphorescent material of choice in the past several years. Compared to its earlier counterparts such as zinc sulfide, strontium aluminate glows up to 10 times brighter and lasts longer. This compound has been widely used in toys, road signs, and other safety-related signages. What are the benefits of using glow in the dark filaments? Glow in the dark filaments are another example of specialty filaments that are really only useful in limited applications. In this case, the name says it all – they glow in the dark! Prints made from this filament can make really nice toys and display items or can also be used for outdoor safety markings and signages. If you are looking for variety, then the wide range of colors of glow in the dark filaments available in various brands should appeal to you. Filaments in the red and violet are widely available, but most users agree that the blue and green variants give off the best glow. Glow in the dark prints can also be finished and customized in a number of ways. They can be sanded and glued together quite easily, so you are only really limited by your own creativity. Working with glow in the dark filaments is not especially difficult. 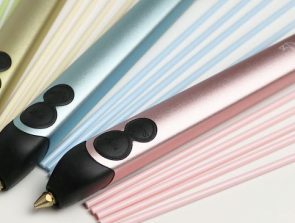 Like other composite materials, the filament is a little brittle and needs to be handled carefully, but the resulting print has very little tendency to warp or shrink. How are glow in the dark filaments used? 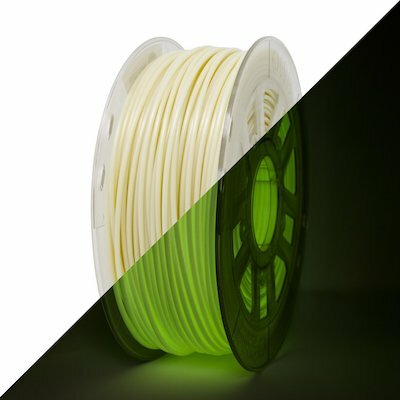 Glow in the dark filaments can be either PLA-based or ABS-based. Obviously, there will be major differences in the printing parameters between the two variants. We recommend starting with standard ABS or PLA printing temperatures, unless otherwise stated by the manufacturer. 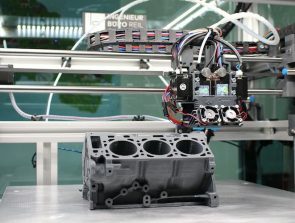 Typically, ABS prints at 210 to 240 °C while PLA prints at a lower temperature of 180 to 220 °C. Should there be issues (typical ones like blobs or stringing), then you can fine-tune the parameters as you see fit. Users have reported good performance of glow in the dark filaments under printing speeds as low as 15 mm/s to as high as 100 mm/s. This is obviously a very wide range, so recommend being prudent and printing at the halfway mark, at around 50 to 60 mm/s. You may work your way up from this setting until an unacceptable degree of stringing is observed. A heated bed is not necessary when printing with PLA-based glow in the dark filaments, although you may use a heated bed with a setting of 60 to 70 °C. On the other hand, an ABS-based glow in the dark filament will need to be printed on a heated bed set at a temperature of about 100 to 110 °C. Standard methods of bed adhesion, such as standard blue painters’ tape on an unheated bed, or an applied layer of glue stick on a heated bed, should work sufficiently well for these filaments. An ABS-based glow in the dark filament is a little more prone to warping, so we recommend not using a cooling fan when printing with it. 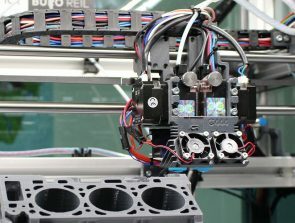 PLA prints are more resistant to warping and can be printed with a cooling fan to help strengthen the final print. Many users have reported that the increasing the wall thickness of prints made from glow in the dark filaments makes the final print glow more intensely. This is a property that you may want to consider when making your own glow in the dark print. By increasing the shells (and decreasing the infill), you can make prints that glow much brighter and for longer. What are the limitation of glow in the dark filaments? When designing any item that will be printed using glow in the dark filaments, bear in mind that the phosphorescent material only absorbs light energy and does not give its own light. This means that the glow of the final print will start to recede immediately when in darkness and will be completely gone in a few hours at the longest. Do not expect your glow in the dark prints to act as light sources that will stay alit all throughout the night. Another characteristic of glow in the dark filaments that makes it a little more complicated to use is that it is quite abrasive, even more so than wood or metallic filaments. We recommend replacing standard brass nozzles with their hardened counterparts to prevent abrasion over time when using glow in the dark filaments. You may also opt to use wider diameter nozzles to reduce abrasion. We have found that a diameter of 0.5 to 0.6 mm works best to produce good prints while eliminating abrasion. Similar to other composite filaments, glow in the dark filaments are also brittle and prone to snapping due to the infused phosphorescent powder. Make sure that the path of the filament from the spool to the extruder is free of any sharp turns, and you should not have any problems. What are the best brands of glow in the dark filaments available today? Glow in the dark filaments are unsurprisingly popular products, so there are a lot of options available out there. Our favorite brands are listed below. 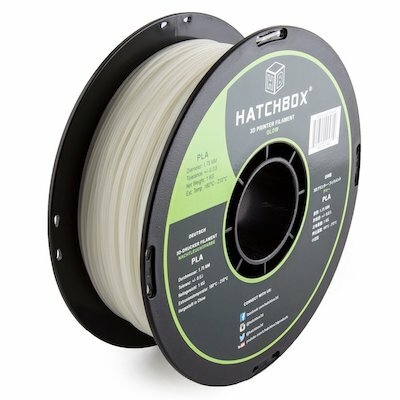 The glow in the dark filament from HATCHBOX is undoubtedly the most popular in its category. It has received great feedback from its buyers, true to the reliable HATCHBOX brand name. 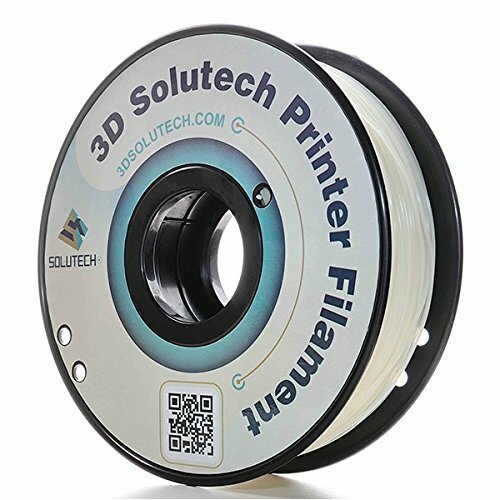 It is a PLA-based filament, allowing it to be printed at lower temperatures and thus retaining great color vibrancy. The filament is available only in 1.75mm diameter and is sold in 1 kg spools. Another well-reviewed product is the PLA-based glow in the dark filament by GizmoDorks. Part of their PLA line of products, this glow in the dark filament glows with a gorgeous bright green hue. This filament is perfect for creating amazing indoor glow in the dark fixtures, as the brightness of its prints is almost unparalleled. GizmoDorks sell these filaments in 1 kg spools and in 2.85 mm diameter. Lastly, the glow in the dark filament from 3D Solutech has also enjoyed a nice level of popularity. The prints made from this filament also come out with a nice green hue that glows very brightly and for quite a long time. This filament is available in 1.75mm diameter and is sold in 1 kg spools. Glow in the dark filaments may not be very practical, but they definitely have the ‘cool’ factor going for them. Again, this is a niche product that serves very limited applications. What it lacks in usability, it definitely makes up for in flair and style. If you’re curious about what you can do with it, or if you have an interesting project in mind, then we suggest that you go for it. Glow in the dark filaments are not terribly difficult to work with, and the resulting prints are absolutely unique. Just make sure to get a hardened nozzle to avoid future problems. We look forward to hearing what you have come up with using your glow in the dark filaments.